The 21st century is an exciting time for gifted education teachers. With the recognition of multiple forms of intelligence and advancements in gender equality, talented students have more opportunities today than ever before. A master's in gifted education online prepares you for an instrumental role in the development of exceptional students' abilities. According to Payscale, gifted teachers bring home more $45,000 each year. The U.S. Bureau of Labor Statistics projects a 10% increase in employment for instructional coordinators, including 16,500 new positions. Professionals who earn their master's in gifted education online equip themselves with the expertise needed to meet the unique academic needs of gifted students. Gifted teachers cultivate enriching learning environments that go beyond standard curriculum requirements of traditional classroom settings. Gifted education teachers receive specialized training that emphasizes teaching students with talent. Graduates of online gifted education programs demonstrate cultural sensitivity and knowledge of learning theories appropriate for the instruction of exceptional students. They possess the ability to select, administer, and score assessments. Most master's in gifted education online curricula consist of core and specialized courses. Core courses familiarize students with common instructional practices used in school settings as well as current and historical theoretical perspectives of the field. Students examine the social and political factors that shape education and their role in the establishment of norms that bring about change. Frequent topics of a gifted education program include curriculum development, classroom management, and professional collaboration. Specialized courses allow educators to choose a particular area of interest. Possible concentrations in this field include gifted education administration, gifted education in elementary school, and gifted education in secondary school. All degree candidates must complete a teaching practicum near the end of their program. University of Alabama ranks #1 on The 30 Best Online Master's in Gifted & Talented Education Programs! The University of Alabama is a renowned public institution of higher education that prides itself on empowering its students through athletic, academic, and professional accomplishments. The oldest public university in the state, Bama accommodates students of all backgrounds, including distance learners. The school's online offerings include a master of arts in special education with gifted and talented certification. This is a blended program, which combines online and web-assisted courses with flexible weekend classes on campus. The degree comprises 30 to 36 credits, with classes in topics like creative problem solving, special populations in gifted education, and diagnosis and assessment of exceptional youth. Students must also complete an internship, which begins with a mandatory skills development and enrichment workshop hosted over the summer. A practicum and comprehensive exam are also part of the degree requirements. With such an intensive curriculum, the Bama program trains students to not only identify the special needs of gifted and talented kids, but also strategize and implement differentiated educational programs that challenge and empower them. Graduates often pursue careers as teachers, administrators, and academic advisors. To qualify for this online gifted education program, applicants must hold an Alabama Class B teacher certification or equivalent. The school also requires a minimum 3.0 GPA and 300 on the GRE for admission. Bama's affordable tuition rate is standard for all distance learners and scholarships are available. University of Missouri ranks #2 on The 30 Best Online Master's in Gifted & Talented Education Programs! Located just two hours west of St. Louis, the University of Missouri is a leader in distance education and offers more than 100 degree programs, including a master of education in special education with an emphasis in gifted education. Mizzou Online's program provides a curriculum that is skill-based and career-focused. Graduates of the program are also qualified to obtain the Missouri gifted education certification. Courses can be completed entirely online and there are three start dates each year. The degree plan consists of 30 credits in classes like curriculum leadership, assessment and evaluation in gifted education, and technology to enhance learning. Students must also complete a practicum experience in which they apply what they've learned in a real educational environment. Those with two years or more of teaching experience in state-assisted gifted programs may apply for exemption. All degree candidates must pass a comprehensive take-home exam. Applicants must submit university transcripts with a minimum 3.0 GPA, GRE scores, and two letters of recommendation to be considered for admission to the program. Though tuition is priced by residency status, Mizzou still offers one of the most affordable online gifted education programs in the U.S. The school also offers a variety of online services and resources for its students, including admissions help and financial assistance, as well as professional development opportunities and tutoring through The Learning Center. University of Georgia ranks #3 on The 30 Best Online Master's in Gifted & Talented Education Programs! Chartered in 1785, the University of Georgia is one of the oldest and most prestigious public institutions of higher learning in the U.S., enrolling over 37,600 students annually in its on-campus and distance education programs. Among the latter options is an online master of education in educational psychology, gifted and creative education, a degree focused on providing students the skills necessary to nurture the specific needs and talents of all children, particularly those in disadvantaged and underserved populations. All courses can be completed remotely and most students earn their degrees in six terms, or two years. To receive their M.Ed, students must earn at least 37 credits and pass a written comprehensive exam. The curriculum consists of courses in advanced topics like characteristics of gifted youth and programming and curriculum for the gifted. All students take the same classes the first two terms, which builds cohort relations, thereby easing the transition into graduate school and building a network of long-term professional support. Subsequent coursework is planned with close guidance from academic advisors. Students round out their master's in gifted education online degree with a practicum, which prepares them for career entry or advancement through real-world application of learned skills. Students may fulfill this requirement at their workplace or at separate location facilitated by the program. Application materials include college transcripts with a minimum 2.6 GPA, GRE or MAT scores, and three letters of recommendation. Online learners can apply for a variety of graduate scholarships. The University of Georgia is regionally accredited by the Southern Association of Colleges and Schools Commission on Colleges (SACSCOC). University of South Florida ranks #4 on The 30 Best Online Master's in Gifted & Talented Education Programs! From its main campus in Tampa, the University of South Florida provides students of diverse backgrounds with accessible academic opportunities designed for working professionals who want to advance their careers through accreditation and advanced skills development. The school's online offerings include a master of arts in exceptional student education, an intensive program that builds on the education and special education foundations that students already have learned, providing in-depth examinations of several types of exceptionalities, such as learning disabilities, behavioral disorders, and intellectual disabilities. In fact, students may choose to specialize in one of these three areas, or they can opt to pursue a generalist track. The degree plan ranges from 32 to 40 credits, depending on the track, and includes required coursework in areas like working with families, advanced psychoeducational assessment, and consultation and collaboration in special education. Students must also complete at least one hour of independent study and a practicum, the latter of which consists of supervised field work with exceptional children, ranging from preschoolers to high school students. It should be noted that though the online master's in gifted education program at USF is comprehensive, it doesn't automatically lead to initial teaching certification. Students must take further steps towards fulfilling those specific requirements. To apply, potential students must submit undergraduate transcripts and GRE scores. Those with at least nine hours of graduate-level work in special education (completed with a 3.0 GPA or above and endorsed by a faculty member) or those with a master's degree in another field are exempt from standardized testing. The University of Southern Florida is regionally accredited by the Southern Association of Colleges and Schools Commission on Colleges (SACSCOC). University of North Carolina at Charlotte ranks #5 on The 30 Best Online Master's in Gifted & Talented Education Programs! Tracing its history back to 1946, the University of North Carolina at Charlotte is the fastest growing campus of the UNC system. The school offers 64 master's degree tracks, many of which are accessible to online students, including the master of education in special education: academically or intellectually gifted. Designed specifically for K-12 educators who hold at least an initial or Standard Professional 1 (SP1) teaching license, the UNCC program provides graduates with the skills they need to enrich and enhance the education of high-achieving students. The degree consists of 33 credits of advanced and writing intensive coursework covering topics like methods of instructing gifted students, theories on creativity, adapting curriculum material, and classroom differentiation. Additionally, UNCC's online gifted education program heavily emphasizes research. Students not only learn the best practices in the field, but also conduct their own research. With the guidance of a faculty advisor, students formally propose, implement, analyze, and present their work, enabling them to gain valuable experience and build professional relationships outside their immediate academic setting. Graduates are qualified to obtain the state-ordained Standard Professional 2 (SP2) teaching license in special education. Four start dates are offered each year. Application materials include a bachelor's degree with a minimum 3.0 GPA and GRE or MAT scores in the 30th percentile or higher. Online students pay tuition based on their residency status. University of North Texas ranks #6 on The 30 Best Online Master's in Gifted & Talented Education Programs! Located in Denton, just an hour from Dallas, the University of North Texas has been providing affordable and exceptional educational opportunities for over 127 years. Facilitated by Blackboard, UNT offers 20 online graduate programs, including a master of science in educational psychology with a concentration in gifted and talented. Designed as an entirely online “Executive Summer-to-Summer” degree, this UNT program is highly flexible and students can earn their master's in as few as 15 months while working. Additionally, students can earn a gifted and talented certificate along with their degree, further improving career advancement opportunities. The curriculum totals 33 credits, which includes required coursework in topics like educational statistics, human development across the lifespan, and program planning for the education of gifted and talented students. Additionally, students must complete a capstone experience, in which they synthesize their cumulative skills and knowledge to conduct original research or evaluate an existing special education program with the help of a faculty advisor. The degree plan for this master's in gifted and talented education program also includes six hours of electives. Courses are structured in rotating three-, five-, and eight-week sessions. Applicants should submit undergraduate transcripts, a professional resume, two letters of recommendation, a one to three page personal statement, and GRE scores above the 50th percentile. All distance learners pay the same affordable tuition rate and eligible applicants receive a one-time departmental grant of $1,000. Liberty University ranks #7 on The 30 Best Online Master's in Gifted & Talented Education Programs! Liberty University is located in Lynchburg, Virginia and hosts a vibrant distance education platform that offers flexible options for degree and certificate seekers. Among the graduate programs available is a master of education in teaching and learning with a concentration in special gifted education. The Liberty program bolsters students' opportunities for career advancement by equipping them with the skills necessary to effectively use learning strategies that nurture and challenge gifted students. The program also prides itself on being accessible to working professionals, as all coursework can be completed online and half of the curriculum may be satisfied by applicable transfer credits from previous college work or life experience, such as job or military training. Students in this online master's in gifted education program take 36 credits in classes like foundations of exceptionality, educational assessment for special needs, and leadership and supervision in education. Liberty also requires a capstone experience and students may choose either a master's seminar on current issues in education or a directed practicum. The former leans heavily on individual research and may be more suitable for students pursuing careers as administrators and curriculum advisors, while the latter highlights hands-on classroom instruction. Students can enter the program at ten start dates during the year and financial aid and scholarships are available. University of Southern Mississippi ranks #8 on The 30 Best Online Master's in Gifted & Talented Education Programs! Founded in 1910, the University of Southern Mississippi dedicates its institutional mission to transforming students into successful and empathetic leaders through programs that are career-centered and socially aware. Many distance learners flock to USM for its variety of degree options, including an online master of education in special education with an emphasis in gifted education, a specialization structured as a hybrid program that requires students to spend some time on the Hattiesburg campus. The degree plan consists of 31 to 36 credits in required coursework, free electives, and choices in research and practicum experiences fulfilled with the guidance of a faculty mentor. Topics include legal issues in educating exceptional learners, school to life transitions, and components of the reading and writing process. As one of the few online gifted education programs that allows students to personalize their curriculum through electives, USM's program is well-suited for those who know which specific skills they would like to develop in order to build their career. It should be noted that the USM program won't result in teaching certification. However, students have the opportunity to gain this credential via the Teach Mississippi Institute (TMI), a summer program followed by year-long internship. Some credits students earn from TMI may be transferred towards their M.Ed. Application materials include academic transcripts, standardized test scores (GRE, MAT, or Praxis II), a personal statement, a resume, and two recommendation letters. All online students pay the in-state tuition rate. University of Nebraska at Kearney ranks #9 on The 30 Best Online Master's in Gifted & Talented Education Programs! The University of Nebraska at Kearney regularly receives praise for the quality of its distance education offerings. Among the 30 degree programs available is an online master of arts in education in special education: gifted education. Consisting of 36 credits, the UNK program is designed for certified teachers who hold an undergraduate degree in the field and affords them to opportunity to enhance their careers through advanced research and integration of curriculum theories with practical teaching methodology to serve the complex needs of gifted and talented students. To earn their degree, students must complete 36 hours of coursework and pass a three-part comprehensive exam, which includes a project, a written portion, and an departmental exit survey. Though there are some core courses all graduate students in the department take, the vast majority of classes will be in the special education: gifted education concentration. Topics include psychology and education of gifted students, curriculum design for specific outcomes, and social and emotional development. Students have the option to pursue a thesis or non-thesis curriculum. However, UNK advises students who want to later pursue a doctoral degree to take on the former option. Those who opt out of the thesis will take an additional seminar in advanced educational psychology. UNK boasts some of the lowest tuition rates among online gifted education programs and distance learners are eligible to apply for financial assistance. The program offers three start dates each year. Application materials include college transcripts and GRE scores. The University of Nebraska at Kearney is regionally accredited by the Higher Learning Commission (HLC). University of Northern Colorado ranks #10 on The 30 Best Online Master's in Gifted & Talented Education Programs! What started in 1890 as a training school for teachers in and around Greeley has grown into a full-fledged institution of higher education, doctoral research, and professional development. The University of Northern Colorado now offers a variety of traditional and online degree programs, including a master of arts in special education with gifted and talented education emphasis. Designed with the input of students, teachers, and experts in the Colorado Department of Education, the UNC program highlights communication and leadership skills in addition to in-depth knowledge of curricular planning and how it can be utilized to best serve the needs of gifted and talented youth. The degree plan totals 36 credits and includes course topics like creativity in gifted education, nature of the gifted learner, and highest levels of learning for the gifted and talented. Students must also complete a supervised practicum of hands-on teaching and coordinating of students in their local communities. Though most coursework can be completed online, degree candidates are required to attend summer sessions where they work with gifted fifth through tenth graders in the UNC Summer Enrichment Program. Application materials for this master's in gifted education online program include undergraduate transcripts with a minimum 3.0 GPA, GRE scores, a resume, and a statement of personal philosophy and professional goals. As part of the Extended Campus, distance learners, regardless of where they live, enjoy the same low tuition rate. In addition to financial assistance and other forms of conventional academic services, like online tutoring and career planning, students may also participate in the Graduate Student Association, a campus group that facilitates conference and research funding and networking opportunities. West Virginia University ranks #11 on The 30 Best Online Master's in Gifted & Talented Education Programs! Located in Morgantown, West Virginia University enrolls over 31,000 students annually. Due to the growth of student enrollment over the past few years, WVU has increased its distance education efforts and today learners may access a variety of online degree programs, including a master of arts with a major in gifted education. Students may pursue their graduate credentials with a simple emphasis in gifted education or they can take the additional step of obtaining a teaching certificate while they earn their master's. Regardless of their specific track, the WVU program engages students in rigorous research that enables them to create and manage curriculum and educational initiatives for gifted students at all levels. WVU offers its master's in gifted education online program completely online in the U.S. and certain international countries. Students take 36 credits in courses like advanced teaching strategies, collaborative-consultative inclusion strategies, and support for special populations in gifted education. A capstone experience completed under the guidance of a faculty mentor is also required. Students have the choice of either completing a practicum (internship) or a culminating project. The program offers three start dates each year. To apply students must submit transcripts with a minimum 3.0 GPA, standardized test scores (GRE, MAT, or Praxis Core), and permission for field/clinical experience. Additionally, those who plan to pursue the degree plus gifted education certificate option are required to submit scores for the Praxis CASE. West Virginia University is regionally accredited by the Higher Learning Commision (HLC). Fort Hays State University ranks #12 on The 30 Best Online Master's in Gifted & Talented Education Programs! Fort Hays State University is an established presence in the world of distance education and nearly half of its student population enroll in online classes and degree programs. The school's online offerings include a master of science in special education - gifted. Consisting of 36 hours, the program highlights technology and case research study approaches to learning and professional development. Graduates leave the program equipped for educational leadership positions in which they develop equitable and enriching programs for gifted and talented students. The FHSU program has no on-campus requirements. All courses are taught asynchronously and facilitated by BlackBoard with topics like cultural diversity, consultation and collaboration in gifted, and vocational and transitional education. Students also take a number of classes in research methods, equipping them with the skills to assess the functionality of a gifted education program. As a capstone experience, students must compile a comprehensive portfolio reflecting their expertise in areas like collaboration, leadership/professionalism, and student growth. Portfolios are reviewed by peers before submission, ensuring quality and giving students a chance to closely network. Most students take two courses per semester and earn their degree in 24-36 months. FHSU does not require an entrance exam for admission to the program. Applicants should be prepared to submit transcripts with a minimum 2.5 GPA, a personal statement, and two letters of recommendation. All online students pay the same tuition and FSHU's rate is among the most affordable gifted and talented master's degree programs online. Lindenwood University ranks #13 on The 30 Best Online Master's in Gifted & Talented Education Programs! Located in St Charles, Missouri, Lindenwood University is a comprehensive, private institution of higher education that provides a diverse catalog of academic programming, including graduate-level distance education programs like the online master of arts in gifted education. Whether you want to advance your career as an honors teacher or as a gifted program coordinator, the Lindenwood program strengthens your ability to recognize the needs of special students, and then design an implement teaching strategies that empowers them both in school and in their personal lives. The degree plan totals 33 credit hours and includes required coursework in areas like assessment of intellectual skills, meeting the affective needs of gifted children, and psychology of teaching and learning. Additionally, students must complete a capstone experience, starting with a class in educational research and culminating in an individualized practicum or master's project. Regardless of what option they choose, degree candidates must show growth and expert knowledge in areas important to professional quality. Capstones are completed with the close help of a faculty advisor, making the end product pertinent to the contemporary field of gifted and talented education. The master's in gifted education online program at Lindenwood is facilitated by the Canvas platform and courses are offered asynchronously. All distance learners pay the same affordable semester-based tuition and a wealth of financial assistance options are available, including endowed scholarships and graduate fellowships. Online students also enjoy support in the forms of career development assistance, subject tutoring, academic success coaching, and counseling services. Western Kentucky University ranks #14 on The 30 Best Online Master's in Gifted & Talented Education Programs! Western Kentucky University is home to over 20,000 students and a host of nationally-recognized academic programs, many of which are available online in flexible and career-focused formats in order to cater to the busy schedules of adult learners. The school's offerings include two options for an online master of arts in education in gifted education and talent development, one for advanced (Rank II) teacher certification and the other for careers in research and development, which prepares students for possible Rank I certification. Both options highlight collaboration and project-based learning while building on the teaching skills students have already acquired through work and prior learning. The degree consists of 30 to 37 credits depending on the student's professional goals and chosen specialization. All students take core classes in topics like student assessment and advanced teaching instruction. Those pursuing a Rank II certification take additional coursework in specified areas such as developing creativity and leadership in gifted youth. Remaining hours are divided between electives and a capstone experience-- either a teaching practicum or research project depending on which path the student chooses. The WKU online gifted education program is highly curated (students can expect a mid-degree assessment) to ensure students get the best education possible in a relatively short amount of time--two to three years. Admissions requirements for the research track include academic transcripts with a minimum 3.0 requirement and if the student is pursuing Rank I, an earned master's degree. Applicants for the Rank II option should be prepared to submit school transcripts with a minimum 2.75 GPA and a teaching certification or proof of eligibility. Western Kentucky University is regionally accredited by the Southern Association of Colleges and Schools Commission on Colleges (SACSCOC). Arkansas State University ranks #15 on The 30 Best Online Master's in Gifted & Talented Education Programs! Located in Jonesboro, Arkansas State University was founded in 1909 as an agricultural school, but today offers comprehensive higher education programs across several disciplines for distance learners, including an online master's of science in education in gifted, talented, and creative. Designed for working educators, the ASU program further develops students' ability to discern and evaluate giftedness while equipping them with the tools needed to create effective educational models for these particular groups of students. Most students earn their degrees in 18 months and graduates often go on to become respected teacher leaders and gifted education advocates. The online master's in gifted education at ASU is focused and intensive. Students take ten required courses (30 credits) in topics like affective programming in the classroom, philosophies of education, and advanced theories on creativity. Internship and capstone requirements are also part of the degree plan. The former helps students network and incorporate skills in classroom organization and management, while the latter centers on independent research and publication. All courses are presented asynchronously, though students do coordinate with the department when it comes time to organize their practicum and capstone. In addition to conventional online student resources like library access and technology support, ASU also provides distance learners with a personal teaching assistant who supports students from admission to graduation. ASU has one of the lowest tuition rates among online gifted education programs, which all distance learners enjoy regardless of their state of residency. Arkansas State University is regionally accredited by the Higher Learning Commission (HLC). Northwestern State University of Louisiana ranks among The 30 Best Online Master's in Gifted & Talented Education Programs! As one of the main public institutions of higher learning in the area, Northwestern State University of Louisiana seeks to provide affordable, career-advancing degree programs to both its online and on-campus students. To this end, distance education opportunities abound at NSU, including a master of education with a concentration in gifted education, an advanced program for already certified teachers who want to cultivate skills in instructional differentiation, including accelerated teaching and utilizing enrichment activities. Through case study, cooperative learning, and practicum experiences, M.Ed students learn how to create the kind of classroom that motivates this specific group of learners. The 36-credit degree plan consists of required courses like psychology of the gifted, action research for school improvement, and instructional improvement and assessment. As previously mentioned, students must also complete a practicum during the spring, an experience coordinated with the help of the department and a faculty advisor to ensure it aligns with school guidelines and degree standards. The school offers all coursework asynchronously, which enables students to incorporate school work into their busy schedules. It should be noted that successful completion of NSU's online master's in gifted education doesn't automatically result in licensure or certification. Degree candidates, especially those residing outside of Louisiana, must pay carefully consider each state's specific licensure requirements. NSU does not charge any additional out-of-state fees for online students who reside outside of Louisiana. Northwestern State University of Louisiana is regionally accredited by the Southern Association of Colleges and Schools Commission on Colleges (SACSCOC). Regent University ranks among The 30 Best Online Master's in Gifted & Talented Education Programs! Located on the coast of Virginia, Regent University regularly garners praise for the affordability of its schooling and the excellence of its distance education programs, especially at the graduate level. To this end, Regent provides two pathways to obtaining an online master of education in curriculum and instruction with a concentration in gifted and talented: with endorsement for students holding a Virginia teaching license and without for those who don't (all out-of-state students). Both tracks provide students with a deep understanding of the psychology of gifted and talented students and the instructional strategies needed to best promote academic growth. Graduates of the Regent program often go on to work as curriculum developers, lead teachers, and department heads in diverse educational environments. The curriculum consists of 35 credits in coursework, such as philosophical foundations in education, advanced classroom management, and models and strategies for teaching the gifted. While the endorsement and non-endorsement option share many features, the key difference lies in the capstone requirement. Students pursuing a gifted and talented endorsement must complete a 45-hour practicum during the second spring semester, which may be completed at their place of work with approval from the department. Students in the non-endorsement track instead complete a professional project, usually in the form of a portfolio, proving that they have met required skill competencies. Online classes are structured in eight- or 15-week sessions. All distance learners enjoy the same affordable tuition rate and academic and professional support, which includes academic advising and career development opportunities. Gardner-Webb University ranks among The 30 Best Online Master's in Gifted & Talented Education Programs! Located in Boiling Springs, North Carolina, Gardner-Webb University offers degrees that combine the liberal arts ethic of empathetic social involvement with the active skill building needed for career advancement. Many of Gardner-Webb's programs can be accessed by distance learners, including a master of arts in curriculum and instruction (K-12) with a concentration in academically/intellectually gifted education. Through an integrative curriculum, students learn and practice the advanced skills needed to cultivate an inclusive classroom that motivates gifted learners. The 33-credit degree plan consists of coursework in the history, philosophy, and methodology of curriculum and instruction for teacher-leaders. Students then take classes in their concentration, but continue to proceed through their degrees as a combined cohort. This allows them to build relationships with, learn from, and grow with professionals who share their passion for education but have different skills and work experience. All degree candidates must spend the last three semesters of the program completing an internship experience of at least 135 contact hours. Gardner-Webb master's in gifted and talented education program prefers applicants with at least three years of teaching experience. Additionally, in order for students to receive endorsement for advanced teacher's certification, they must hold initial certification by the time they graduate the program. A minimum undergraduate GPA of 2.5 is also required for admission. Gardner Webb-University is regionally accredited by the Southern Association of Colleges and Schools Commission on Colleges (SACSCOC). University of Louisiana at Monroe ranks among The 30 Best Online Master's in Gifted & Talented Education Programs! The University of Louisiana Monroe boasts over 80 years of student success and professional advancement. Today, through the school's eLum distance learning platform, students can access a number of fully-accredited online degree programs, including a master of education in curriculum and instruction with a special education, gifted education concentration. Designed for professionals with valid Louisiana teacher's certificates, the ULM program provides a rigorous and comprehensive study in assessing giftedness in K-12 students and designing educational programs that align with their specific needs through methods of instructional differentiation. The degree comprises 36 credits and includes coursework in research-based instruction, effective consultation, and the social and emotional needs of gifted learners. Additionally, students must complete two teacher leader experiences. The first emphasizes the application of research methods in the collection and analysis of new data and/or the assessment of existing and pertinent information. The second is a practicum in which degree candidates work in schools or other educational environments, demonstrating learned leadership skills. Online courses are asynchronous and class size is small (only 15 students are enrolled each year), which means online gifted education students enjoy a flexible but intimate learning experience, with ample opportunities to build professional relationships with faculty and peers. Applicants must hold teaching certification and submit transcripts showing a minimum 2.75 undergraduate GPA or 3.25 minimum graduate GPA and a GRE score of 292 or above. Those with a 2.75 GPA or better don't need to submit test scores. Those with a 2.5 GPA of better may be admitted on a conditional basis. The University of Louisiana at Monroe is regionally accredited by Southern Association of Colleges and Schools Commission on Colleges (SACSCOC). Millersville University of Pennsylvania ranks among The 30 Best Online Master's in Gifted & Talented Education Programs! Recognized as one of the top public institutions of higher education in the northern United States, Millersville University of Pennsylvania offers a variety of online academic programs. Among the options for distance learners is a master of education in gifted education, which prepares students to teach in gifted programs and inclusive classrooms through the development of specialized skills. It should be noted that this M.Ed doesn't confer teacher certification. Students should familiarize themselves with this distinct process in their home state before applying to the Millersville program. Totalling 36 credits, the degree plan emphasizes educational psychology as the foundation for assessing giftedness and providing effective instruction. Additionally, students learn how to assess gifted education programs, enabling them to pursue careers as coordinators and administrators as well as teachers. A practicum is also required and students work closely with a faculty advisor to ensure the experience is fruitful to them while also aligning with program guidelines. Rolling admissions enable students to begin earning their degree at their convenience. Courses are completely online and asynchronous, meaning students can progress through the online gifted education program at their own pace. Application materials include a bachelor's degree, a Rank I instructional certification, and a minimum GPA of 2.75. GRE scores are also required unless an applicant has a GPA of 3.0 or higher. The school determines tuition rates based on residency status. All distance learners have access to financial assistance. Millersville University of Pennsylvania is regionally accredited by the Middle States Commission on Higher Education (MSCHE). Wichita State University ranks among The 30 Best Online Master's in Gifted & Talented Education Programs! Established in 1895, Wichita State University prides itself on innovation and accessibility, offering numerous academic programs for distance learners, including a master's of education in special education with an emphasis in gifted education. Wichita's program is suited for licensed educators who want to strengthen their instructional and program development skills to service intellectually gifted students. With fully asynchronous online classes and flexible scheduling, M.Ed students can pursue their degree full-time while working and attending to other obligations. WSU graduates are equipped to become successful teacher leaders in schools, public organizations, and private education centers. The degree plan for this master's in gifted education online program totals 30 to 33 credits in coursework that includes curriculum theory, best practices in teaching gifted students, research, and assessing educational programs. Students must also complete a culminating experience with an optional thesis or a non-thesis version involving an internship. Though the curriculum is designed to be comprehensive, the program may not satisfy teacher certification requirements outside of Kansas. Out-of-state students must ensure they follow their state's licensing protocol. To apply, potential students must submit transcripts with a minimum 3.0 GPA and a valid teaching license/certificate (or official notice of eligibility). Online learners, regardless of where they live, pay the same affordable tuition rate and have access to financial aid, including private scholarships and institutional fellowships. Academic and professional resources are also available to online students, including student orientation, tutoring, and advising. Wichita State University is accredited by the Higher Learning Commission (HLC). Converse College ranks among The 30 Best Online Master's in Gifted & Talented Education Programs! Located in Spartanburg, South Carolina, Converse College enrolls nearly 1,500 students in its traditional and distance education programs, which includes four options for online graduate students. The school's master's of education in gifted education is a comprehensive program that prepares experienced professionals to apply newly learned skills to the classroom, motivating and challenging gifted and talented students. Converse offers this program entirely online and its flexible classes are designed to mimic classroom engagement, enabling students to collaborate with faculty and each other. The 36-credit curriculum includes coursework in the nature and needs of the gifted, advanced curriculum practices for the gifted, and theories and design in action research. The program also includes two practicum experiences that demonstrate the degree candidate's ability to lead and facilitate instructional differentiation techniques for the benefit of gifted students. Online students are welcomed to complete their practicum in their local communities with approval from the department. Alternatively, they can opt to fulfill the requirement over the summer on the Converse campus where they can work with elementary students in a two week long summer camp program. To qualify for the Converse online master's in gifted education program, applicants must submit transcripts with a minimum 2.75 GPA and valid teaching certification. Note that this program does not automatically grant advanced certification. All online students pay the same affordable tuition rate and may access financial aid opportunities. Converse College is regionally accredited by Southern Association of Colleges and Schools Commission on Colleges (SACSCOC). Eastern Kentucky University ranks among The 30 Best Online Master's in Gifted & Talented Education Programs! Eastern Kentucky University routinely receives praise for the quality of its distance education programs. The school's online offerings include several options for graduate studies, such as the online master of arts in education - gifted education. This EKU program highlights best practices in the field of special education, preparing graduates for advancement as teacher leaders, program coordinators, and school advocates. Students with Kentucky teacher's licenses become eligible for Rank II endorsement through the program. The degree plan totals 30 credits and courses are structured asynchronously and last eight weeks each. Students take classes in topics like leading achievement change, effective instructional models and practices, and curriculum in gifted and talented education. Additionally, students must fulfill practicum and capstone requirements. The former enables students to integrate developing skills in a real-world educational setting, while the latter focuses on independent research, allowing students to demonstrate their knowledge of best practices in gifted and talented programs. All EKU students enjoy small class sizes and a learning model that stresses the importance of cooperative work and community building. Tuition for the online gifted education program is charged at a flat per-credit rate regardless of students' state of residence. EKU also offers support in the form of online tutoring, academic advising, and library services. Distance learners can also access the Center for Career and Co-Op, an online resource for job guidance, resume help, and professional development opportunities. Applicants must have a minimum 3.0 GPA and adequate GRE or MAT scores: 150 or 389, respectively. Eastern Kentucky University is regionally accredited by Southern Association of Colleges and Schools Commission on Colleges (SACSCOC). Drury University ranks among The 30 Best Online Master's in Gifted & Talented Education Programs! Located in Springfield, Missouri, Drury University was founded in 1873 as a private liberal arts college. Today, Drury is a teaching university that enrolls over 1,300 students in 70 academic programs, including five at the graduate level. One such program is an online master of education with an emphasis in gifted education that prepares teachers to recognize and assess intellectual giftedness in K-12 students, as well as develop and implement instructional plans that fit the students' complex needs. Degree candidates who hold Missouri teaching certificates are eligible for endorsement upon successful completion of the program. The curriculum comprises 36 credits of coursework in educational technology, social justice and diversity in education, and administration and supervision of gifted programs. As a culminating experience, students must complete a paper or project embedded in a capstone seminar that demonstrates personal growth and in-depth knowledge of educational differentiation and other theories related to gifted education. The degree culminates with a comprehensive exam. Online courses at Drury are taught asynchronously and there are no on-campus requirements, meaning students can complete coursework when it's convenient for them. To apply, potential students must have earned a bachelor's degree from an accredited institution with a minimum 2.75 GPA. Online students pay one affordable tuition rate regardless of where they live. Financial assistance is available, including specific scholarships for students in the master's in gifted education online program. Additionally, teachers in one of Drury's partner schools receive a 50% tuition reduction. Drury University is regionally accredited by the Higher Learning Commission (HLC). Wilmington University ranks among The 30 Best Online Master's in Gifted & Talented Education Programs! Wilmington University is located in New Castle, Delaware and has been offering accessible educational opportunities since 1968. Today Wilmington enrolls over 20,000 students annually in its campus-based programs as well as online through distance education facilitated by Blackboard. Experienced teachers who want to gain specialized skills towards career advancement and licensure may enroll in Wilmington's online master of education in instruction: gifted and talented program. Emphasizing research-based practices, this M.Ed track prepares students to pursue careers as K-12 teachers, curriculum developers, and gifted program coordinators. The 33-credit degree can be completed entirely online or in a hybrid delivery format. Students must be currently employed in an educational setting in order to complete the practicum and competency assignments. Course topics include instructional design, culture and learning environments, and psychology of gifted and talented learners. Students also pursue classes in action research, developing skills in student evaluation, and program assessment. The online gifted education degree at Wilmington University is state-sponsored and, for degree candidates who hold a Virginia teaching certificate, leads to endorsement for advancement. Application materials include GRE or Praxis I scores and college transcripts with a minimum 3.0 GPA. The school also requires applicants to hold a valid teaching degree. All distance learners can access Wilmington's services and resources, including financial aid, technology support, and personalized academic advising through the Student Success Center. Students also receive career guidance, including job search assistance, resume building, and interview preparation. 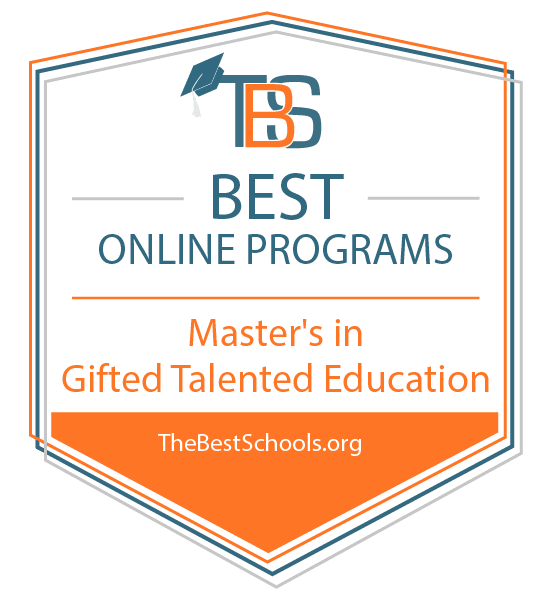 Mary Baldwin University ranks among The 30 Best Online Master's in Gifted & Talented Education Programs! Located in Staunton, Virginia, Mary Baldwin University has a long history of providing academic opportunities for adult learners. What started as a small school for women has grown into a comprehensive co-ed university that offers a number of distance education programs, including an entirely online master's of education in gifted education. Designed for certified Virginia teachers who want to earn a graduate degree and advanced endorsement in the specialization, MBU's program covers every skill-step of the field, from identifying and evaluating intellectual giftedness in K-12 students, to creating and assessing the effectiveness of gifted education programs and procedures. To earn their M.Ed and endorsement, students must complete 35 credits in coursework, such as technologies to advance learning, advanced studies of gifted learners, and an integrated approach to exceptionality. A 45-hour practicum is also required and students, with permission of and guidance from the department, may fulfill this experience at their place of work. The degree culminates with an inquiry research project. While the practicum tasks students with applying skills to real educational scenarios, the project emphasizes academic research and analysis of a topic the student is passionate about. MBU boasts an outstanding track record for student success; nearly 100% of its education students go on to obtain initial or promoted licensure or certification. Distance learners at MBU enjoy one of the most affordable tuition rates among online gifted education programs. With available scholarships and loans, this price can be lowered even further, depending on eligibility. Mary Baldwin University is regionally accredited by Southern Association of Colleges and Schools Commission on Colleges (SACSCOC). McNeese State University ranks among The 30 Best Online Master's in Gifted & Talented Education Programs! McNeese State University provides affordable academic programs for the small communities in and around Lake Charles, Louisiana, as well as individuals all over the U.S. through its distance education platform. Those interested in graduate studies can find online degree options like the master's of education in curriculum and instruction with a concentration in academically gifted education. This is a hybrid program in which students need to take certain classes on campus. The MSU degree comprises 36 credits and emphasizes research, a crucial aspect in the development and assessment of gifted programs. Students will take several courses in foundational methods and applied techniques in special education best practices. Additional topics include supervision of student teachers and characteristics of gifted individuals. Degree candidates must also fulfill a practicum requirement, which includes supervised field experience coordinated by the help of the department and a faculty advisor. The MSU program's hybrid format gives students the benefits of a flexible education which accommodates their busy schedules, while also providing the camaraderie and hands-on learning that comes with classroom learning. To apply to the online master's in gifted education program at MSU, potential students must submit transcripts and a minimum GRE score of 290 (combined verbal and qualitative). MSU accepts up to nine transfer credits, which, when combined with the low tuition rates and financial aid opportunities, makes a degree from MSU an affordable option. McNeese State University is regionally accredited by Southern Association of Colleges and Schools Commission on Colleges (SACSCOC). Eastern New Mexico University ranks among The 30 Best Online Master's in Gifted & Talented Education Programs! Eastern New Mexico University offers over 90 academic programs, many of which are accessible to distance learners, including an online master of education with an emphasis in gifted education pedagogy. Designed for experienced teachers who want to advance their careers through additional academic credentials and certification endorsement, the ENMU program stresses the application of differentiated instructional techniques and accelerated teaching methods. ENMU graduates often go on to become leaders in their fields. The university enjoys a 95% student approval rate. With a curriculum totalling 51 credits, the ENMU program stands out among other gifted and talented master's degree programs online for its sheer size and comprehensiveness. Students take core classes in fundamental topics like theories of learning and assessment before pursuing more specialized classes, such as creativity across the curriculum and educational psychology. The curriculum's breadth also leaves room for electives, enabling students to personalize their studies. They can opt for a practicum/internship or another advanced course in the field. There are no capstone requirements. Coursework can be completed online through Blackboard. Applicants must submit transcripts and GRE scores. To be eligible for the gifted education endorsement, they must also hold a New Mexico teaching certificate. ENMU tuition is affordable and out-of-state online students can pay the lower in-state rate if they are taking less than 6 credits per semester. Financial aid, including scholarships and graduate fellowships, is available. Distance learners also enjoy online resources, including professional development assistance and tutoring through the Online Writing Center. Cleveland State University ranks among The 30 Best Online Master's in Gifted & Talented Education Programs! Cleveland State University has been conducting eLearning classes and programs for over 10 years. Today, CSU offers fully-accredited undergraduate and graduate degrees, including an online master's of education in gifted education that also helps licensed teachers earn certificate endorsement. Through a rigorous but flexible curriculum, educators learn how to respond effectively to the cultural, emotional, and intellectual needs of gifted learners, while also using teaching best practices to improve test performance. CSU alumni are well-respected in the education field, holding positions as teacher leaders, gifted education advocates, and curriculum planners. The 36-credit degree includes courses in educational research, technology for gifted learners, and creativity and productivity inquiry. Students must also complete a practicum in gifted education, an experience that can be done at their workplace with approval from the department. The practicum emphasizes guided work under the supervision of an advisor that builds leadership skills and instructional differentiation techniques in a classroom or similar educational environment. The CSU online gifted education program has no on-campus requirements. Students can earn their degrees at a pace that works for them. Application materials include two letters of recommendation, GRE or MAT scores, and undergraduate transcripts. Applicants with a 3.0 GPA or higher don't need to submit standardized test scores. All online students pay the same affordable tuition rate regardless of state residency status. Louisiana State University - Shreveport ranks among The 30 Best Online Master's in Gifted & Talented Education Programs! Louisiana State University is one of the premier public institutions of higher education in the southern U.S. The school prides itself on its academic rigor as much as on the performance of its athletic teams. Distance learners will find a large catalog of degree programs, including an online master of education in curriculum and instruction with a concentration in academically gifted. Designed to fit the professional needs and busy schedules of working teachers, the LSU program can be completed entirely online with courses structured in accelerated seven-week sessions. Online class sizes are small, allowing students to work collaboratively and build relationships with their peers and professors. Consisting of 36 credits, the curriculum includes required courses in topics like methods of teaching the gifted, developing creative thought, and educational technology applied to the classroom. Coursework is comprehensive, building on all the key elements of effective gifted instruction and program development. The program typically culminates with a practicum, though degree candidates who have at least three years of teaching experience in a gifted classroom or similar educational environment may be exempt from this requirement. To be eligible for the program, students must have a minimum 2.5 GPA from another master's degree or a minimum 2.75 GPA from a bachelor's. Tuition at LSU is one of the lowest among online gifted education programs, and can be reduced further by applying for financial assistance and scholarships. Louisiana State University is regionally accredited by Southern Association of Colleges and Schools Commission on Colleges (SACSCOC). Graduates of an online gifted education program work in instructional and administrative capacities in a variety of academic settings. The following careers are commonly pursued by professionals with a master's in gifted education. These professionals value student success and demonstrate patience and compassion in the classroom. Kindergarten and Elementary School Teachers: Gifted teachers at the primary level may see different groups of children daily or weekly. Their responsibilities include developing engaging lesson plans, communicating with parents, and maintaining a positive classroom culture. While the minimum degree requirement for elementary school teachers is a bachelor's degree, earning a master's in gifted education online expands employment opportunities. Middle School Teachers: Typically working with 6th through 8th graders, middle school teachers have similar duties as elementary school teachers. Gifted education middle school teachers may teach children who excel intellectually across a broad range of areas, or they may specialize in the instruction of students with high aptitudes in a specific subject such as art or music. Instructional Coordinators: Job duties of instructional coordinators include developing schoolwide curriculum plans and training teachers in emerging evidence-based teaching practices. They frequently analyze data to assess school performance and implement strategies for improvement. A master's degree is required for employment as an instructional coordinator.